I’m slightly smug about these, because I actually finished these last Saturday night (well, about 2:30 am on Sunday actually) just hours after Hadley had posted what she wanted. This month’s requirement was for low volume vomit, with grey, dark pink and turquoise cross blocks. I can tell you, finding 49 different low volume 2 1/2″ pieces was quite the challenge, because if you look at my stash it’s definitely at the bright, saturated end of things, but I finally managed it after rifling through all sorts of charm swaps and scrap bags and fat quarters – phew! aww so you wouldnt fancy making me one of those blocks then? 😉 Seriously loving the LVomit! 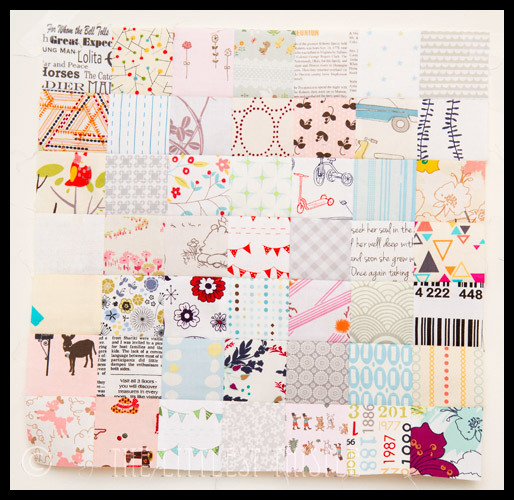 Love your blocks, they look fab ! I'm just making a scrap vomit using left over strips from the two scrappy tripalongs that I have made. It's definitely easier than sewing together all those tiny pieces. I liked these blocks too. My first venture into LV. Good job I've had my month…! Another Hadley blinder! It's going to be gorgeous, and I could almost be tempted! What a pity it is called the vomit block. Because it is so pretty. Im pretty sure you need to make some of those for me! Low Volume is certainly a hole in my stash as well. I am finding that is a hole as well as fussy cut pieces. Your blocks are lovely. I am finding you are like me in that you like to finish your blocks early in the month. Those blocks look fabulous. 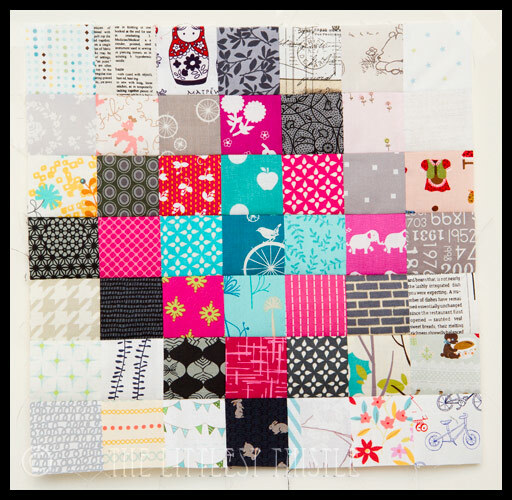 A low volume scrap vomit quilt will look really awesome! Fab, but you're a great big showoff, it's not like I'm now 3 months behind or anything, smarty pants!! Wow, surely she did not need you to have every single one be different. The blocks look wonderful. Crikey that's a lot of stash hunting! Looks good though. They look brilliant!! That quilt will be amazing!! Lucky Hadley! Too many small squares is whey we have our bee mates make them! I struggled finding 52 small squares last month, so I totally feel your pain! she's such a bully – but it will make an awesome quilt!!!! I love how your blocks for Hadley turned out! I started pulling fabric and right now it's a mountain of scraps! They are going to look very beautiful all together, but I'm with you. Too many little squares to cut and piece. Strip piecing for me!